We don’t know when the ‘Royal George’ was built nor anything about its history prior to 1840. Since that time we are fairly confident it has always been a beerhouse or what we know today as a pub. It hasn’t always been called the Royal George. All the rate books between 1867 and 1880 and the 1871 census refer to it as the ‘Boars Head’. 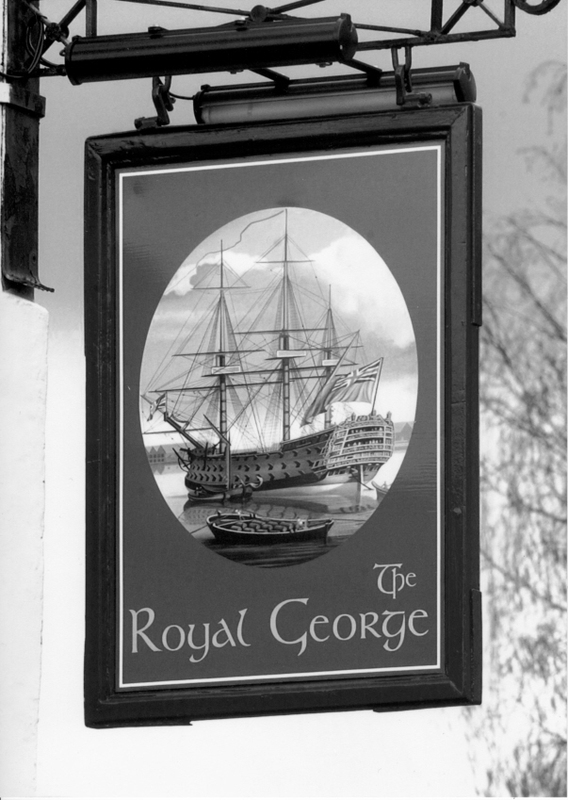 We don’t know why it was called by this name, nor why it changed to ‘The Royal George’. We have been told that the new name was first used in 1875, but in our records its first appearance is in the 1881 census. Around 1880, the Mop fair, held twice a year was moved from the High Street to the yard of the Royal George. Until that time the High Street was crowded on Mop days with fairground attractions and stalls. However pressure from townsfolk led to the Courts enforcing legislation preventing anyone from blocking pubic highways and pavements. This forced the stallholders to move off the street and seek another site. Only a few stalls could be accommodated and the rest were driven away. This, added to the fact that fewer servants were using the Mop to gain employment, hastened the demise of the Mop tradition and it finally finished in the 1890’s. We haven’t seen the deeds of the property, but we have been up a fairly detailed history of the people who owned the pub and the licensees since 1840 up to 1970’s. In the 1840 Tithe Survey the house was plot 253 owned by Samuel Leonard and occupied by Abraham Cole. Samuel Leonard – Samuel was baptised in Hill on 14th December 1791. He was the son of Samuel Leonard and his wife, Mary (nee Wetmore). On 19th May 1817 Samuel married Hannah Adams in Hill. Hannah was baptised in Hill on 29th July 1792, the daughter of Samuel and Hanna Adams. Samuel Leonard was a yeoman farmer and the baptism records of his children show that Samuel and Hannah were living at Nupdown (or in some records Nuptown) farm shortly after their marriage. We don’t know if their links to this property go back further, but we noticed that they continued to be living there right up to the end of the century. Their first daughter was Sarah Cox Leonard baptised on 13th August 1821. Then came Mary Cox Leonard baptised on 6th October 1822, followed by Hannah Maria Leonard baptised on 31st December 1826 and John Samuel Leonard baptised on 27th September 1829. We don’t know the full extent of Samuel’s property holdings and how he came to own a number of properties around The Plain. The 1841 census shows Samuel was a farmer aged 45 at Nupdown Farm, Hill. He was living there with his wife, Hannah aged 45 and their children, Mary aged 15, Anna aged 11 and John aged 10. Hannah died aged 51 and was buried on 30th December 1843. The 1851 census shows Samuel as a widower, farmer of 200 acres assisted by his son, John Samuel aged 21 and daughter, Anna Maria aged 23 and their six servants. Samuel died aged 67 and was buried on 22nd August 1856. James Knapp – we know from the rate books of 1859 to 1885, and the licensee records of Thornbury Petty Sessional Court 1881 to 1884 that James Knapp was the owner of the Royal George. We had a lot of problems in identifying which of the several James Knapps around in this area was connected with the Royal George as he was never recorded there in the census records. Our only clue was the 1865 Voters Record which a James Knapp was entitled to vote because he owned a property in Thornbury occupied by Richard Cowle. Although we know that Richard Cowle had moved to Bristol in 1858, we feel this property must be the Royal George – the fact that the 1874 Voters List also shows Richard Cowle living in the same property indicates that the name of the occupant on the Voters List was only used as an indication of the property and not an accurate record of who was living there. The importance of both the Voters Lists was that it gave the home address of James Knapp as Redwick, Monmouthshire. In December quarter 1845 James married Mary Cox Leonard in Bristol. Mary was baptised on 6th October 1822 at Hill, the daughter of the previous owner of the ‘Royal George’, Samuel Leonard and his wife, Hannah. We know from the census records that John and Mary Knapp were living in Redwick in the 1860’s and the baptism records of Redwick Church show that Fanny Knapp, one of their children was baptised there in 1856. We feel safe in assuming that it was this James Knapp who was connected with the ‘Royal George’. James Knapp was baptised on 30th June 1816 at Oldbury Church. He was the son of James Knapp, yeoman and his wife, Hannah (nee Neale and widow of Robert Comely) who lived at Cowhill. In the 1841 census they are living at Westend, Oldbury where James (snr) was a farmer. Following James and Mary’s marriage in 1845, they moved to live in Monmouthshire. The baptism records of their children show that they first lived at Pill Cott, Magor. Mary Cox Knapp baptised in Magor on 1st April 1846, but she died aged only 6 months and was buried on 16th October 1846, and Anna Maria Leonard Knapp was baptised there on 8th December 1847. The records show James to have been a yeoman at this time in Magor. By 1849 they had moved to Ty-Coch, Llantarnam near Cwmbran. Their daughter, Mary Jane was baptised here on 26th October 1849. The 1851 census shows the family were living at Ty-coch, Llantarnam near Cwmbran. James was described as a farmer of 131 acres employing 3 men. He and Mary had two children: Anna Maria aged 3 born in Magor and Mary Jane aged 1 born in Llantarnam. Further baptism records show that the family move back to Magor where James became an innkeeper at the Golden Lion. Their daughter, Sarah Cox Knapp, was baptised here on 11th January 1852 and John baptised on 29th January 1854. By 1856, the family had moved again, this time to Redwick. Their daughter, Fanny, was baptised here on 27th April 1856. We haven’t been able to trace them in the 1861 census. By 1866 they had moved to nearby Undy where they were living in ‘Great House’ and James was working as a farmer. On 14th February 1866 their son, Arthur, was baptised at Undy Church. The baptism record shows he was born in March 1860. The 1871 census shows the family still living in the Great House at Undy. James was a farmer of 220 acres and employing 4 men. Of their children living with them: Mary J was a dairy maid aged 21, Sarah a house maid aged 19, John an agricultural labourer aged 17 and Fanny aged 15, Arthur 11 and Ursula aged 8 were scholars. Mary died aged 55 and was buried at Undy on 29th January 1878. The 1881 census shows James still in Great House farm which was now 186 acres and employed one boy. He was assisted by two of his children: John and Ursula and a niece, Ida Knapp who was a dairy maid aged 16 from Oldbury. James died aged 70 and was buried on 28th July 1885. Following James Knapp, the next two owners of the Royal George also ran the pub. These include William Cullimore who owned and ran the pub up to his death in 1907 and Samuel Phipps who was licensee until 1923. We have written more about these two people on the page on licensees. We are not sure when, but certainly before 1925 the pub was taken over by W. J. Rogers Brewery of Jacob Street, Bristol. This brewery was taken over by Simonds Brewery in 1935 who later became part of Courage Brewery group. Later when the Government forced a sale of the pubs owned by the major breweries the pub became part of the Unique Pub Company. The Royal George has been the subject of three controversies regarding changes which the owners made whilst trying to modernise the pub. In 2004 a new painted sign was hung on the corner of the building showing the head of a monarch, presumably one of the Georges. Whilst most people did not notice or care about the change, some locals objected and argued that the pub should not be allowed to change its image and links to the maritime history. The Council forced the owner to erect a sign showing a warship (shown in the image on the right). It is interesting to note that in our collection of photos of the pub none of the photos up to the early 1970’s show any sign at all and when one was erected it showed the Simonds brewery logo. The second controversy arose when the owners spent a lot of money refurbishing the pub and improving its overall appearance. Some locals objected to removal of two coloured leaded glass screens which were visible in the two downstairs windows quoting they were of ‘historical significance’. The planners originally allowed this change subject to one of the panels being used in an internal display, but following the objections they forced the owners to have reproduction screens made and fitted inside the two sash windows. This resulted in a rather strange effect with the coloured glass just visible through the modern windows and prevented the landlord from being able opening the sash windows. It is interesting to note that the ‘historical panels’ do not appear in any of our photos of the pub up to the 1970’s. Then in August 2016 when the pub was being changed from ‘The Mezze at The Royal George’ back to simply ‘The Royal George’ the owners spent a lot of money sprucing up the paintwork of the building. Instead of being pleased that the future of the business was being supported, rather than being allowed to deteriorate and risk closure as so many other businesses in Thornbury, some locals objected that the building looked ‘too white’. They pointed out that the external walls should have been painted heritage cream ‘in keeping with other properties nearby’ . The owner claimed that ‘the colour had said heritage cream on the tin’. The subject of the pub sign was again raised by one councillor who objected to the new pub sign. He demanded that the ‘historic sign’ be put back. By historic, he was referring to the sign which had been put up twelve years previously!